Hitachi designed the EC12 air compressor as a portable electric appliance for those who need easy access to a compressor to run various tools like nailers. Even the best air compressor can occasionally malfunction or not work as expected. Troubleshoot your EC12 air compressor to help identify any potential problems and fix them. Plug the EC12 directly into a grounded electrical outlet or a three-wire extension cable with an American wire gauge (AWG) size of 12 to 18, depending on the length of the cord as listed in the EC12's user's manual (see References). 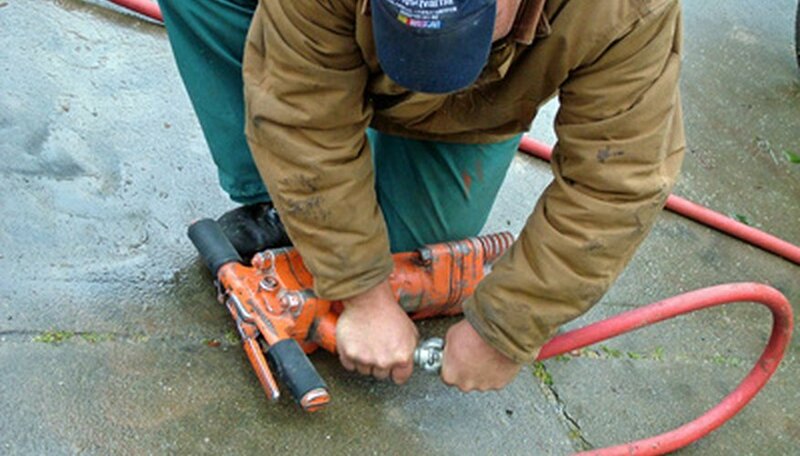 Using the improper type of extension cord for this power-hungry tool can cause the compressor to overheat or shut down unexpectedly. Check the EC12's engine oil levels if the appliance won't start or turns off randomly. Unscrew the plastic cap on the top of the tool's cylinder. Wipe the dipstick attached to the cap on a rag and reinsert it into the oil well. Remove the dipstick and check where the oil reaches on the dipstick's measurement marks. Add oil if needed. Hitachi recommends SAE 5W50 synthetic oil for year-round use or SAE 10W40 multi-graded oil for summer use only. Verify that the power switch on the EC12, located on pressure switch control on the top of the compressor, is pushed toward "ON" if the device won't turn on. Adjust the EC12's pressure if the device isn't emitting sufficient pressure for any attached accessories, like staplers or nailers. Turn the pressure knob, located on the EC12's cylinder, toward the right to increase pressure or toward the left to decrease pressure. Consult the user's manual for any attached accessories to determine how much pressure you need. Contact Hitachi's support service line toll-free at 800-448-2244 if you still cannot get the air compressor to function properly. What Type of Oil Do I Use for an Air Wrench?